Major Walter Cushing fought with the Filipino-American guerrillas in WWII. I was introduced to him while reading, The Intrepid Guerillas of North Luzon. He kept evading the Japanese by pretending to be a Spanish priest. He was mestizo; half Mexican and half Canadian and could pass for Filipino. His battles against the Japanese were fairly successful but the day came when the Ganaps (pro-Japanese Filipinos) turned him in and gave away his whereabouts. It was a foggy day morning. My cousin was disappointed we couldn’t see the view but we thought the fog was beautiful. There actually wasn’t a lot written about him. It was the manner in which he died that captivated me. I don’t remember all the details (it’s been a while). The Japanese surrounded Walter and he killed quite a few of them. Instead of allowing himself to become a prisoner of war, Walter shot himself. Taking his own life rather than becoming a prisoner of war is kind of like Japanese culture, they fought to the death (surrendering is shame). It is said that they were so impressed with him that they buried him with honor. Walter poured a lot of his life savings into a mine in Kalinga, Philippines where he was part owner and when the war broke out orders were to destroy everything so it didn’t end up in enemy hands. He was bitter and had a burning hatred for the Japanese because of this. He found disorganized soldiers and weapons in deserted barracks. He was determined to rage war against the Japanese and was pretty successful. His unit didn’t fare as well after his death. 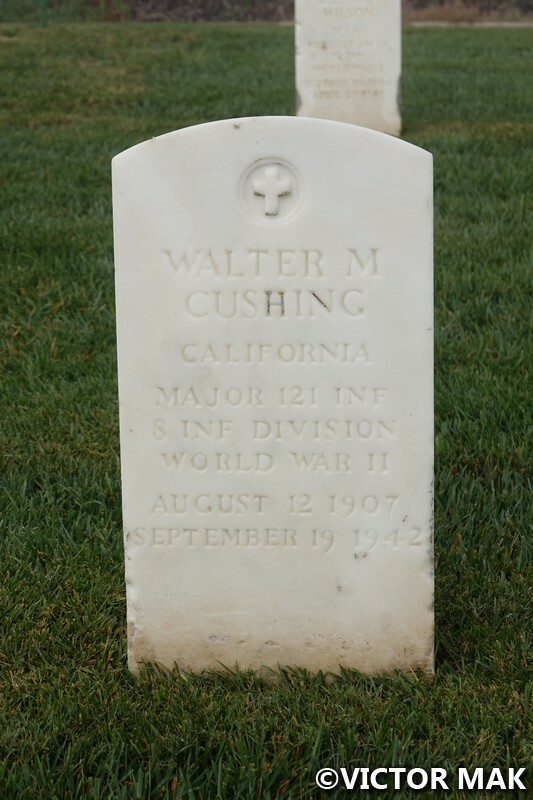 When I realized Walter Cushing was buried in a military cemetery, Fort Rosecrans, in San Diego, it sent me to the moon and I just had to visit him. 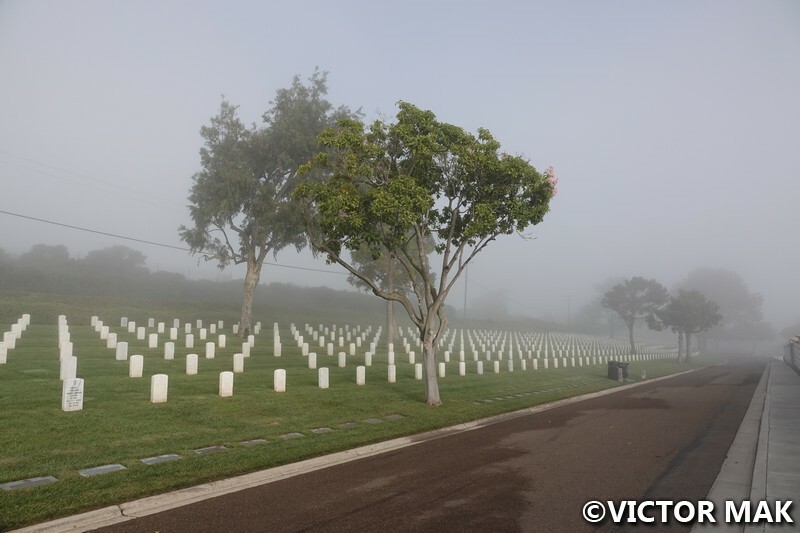 Fort Rosecrans National Cemetery is located 10 miles from Downtown San Diego. It’s a beautiful cemetery and a nice final resting place. My cousin and her hubby drove us here. I felt bad having them go out of their way but she said it was ok, her hubby likes this stuff (his Dad was career Navy) and it was on our way to Cabrillo National Monument. I must not look like the type to enjoy a good war book or movies. Vic tells me I read a lot of war books for a chick. When I said I had a guerrilla to visit at Fort Rosecrans my cousin’s hubby asked with a look on his face, “to clarity, gorilla (spelling it out) or guerrilla?” And I answered by mentioning, The Intrepid Guerrillas of North Luzon. Here’s another book that briefly mentions Walter, Guerilla Priest by Stephen Griffiths. And while were were standing in front of Walter’s grave paying our respects, I just said, “Basically from what I’ve read, he was a crazy guy and just had to meet him.” Sometimes I wonder, what would have happened if the Ganaps never turned Walter Cushing in to the Japanese. Thank You, to all the veterans who serve (past and present). Also, Thank You to their families, they sacrifice a lot too. 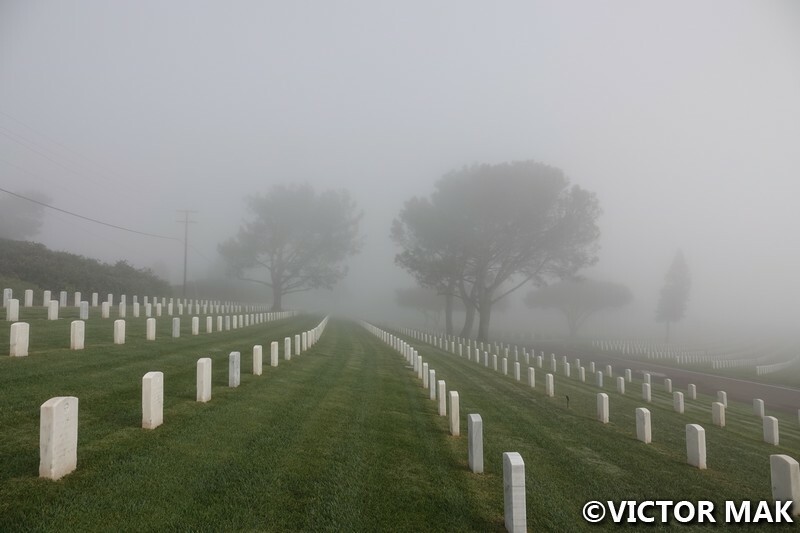 Posted on April 5, 2019 by jebusandandrea	This entry was posted in Cemetery, Hiking, North America, USA, War History, WWII history and tagged CA, California, Explore, Ft. Rosecrans, Photography, San Diego, Southern California, Travel, WWII Guerrilla. Bookmark the permalink. I’d never heard of Walter Cushing before this: thanks for posting this. While I like histories of the Civil and Revolutionary Wars and of samurai era Japan, texts about World War II makes me…sad. As a Japanese American, I associate that period with a lot of grim experiences for my family. Then the Philippines endured a lot at the hands of the Japanese during the war; before that, they were forced into becoming a colony of Spain and later a territory of the US. Most of us don’t hear anything about the resistance there: there’s so little regard for the history of smaller nations outside of the US. Also interesting that you got to visit the military cemetery. San Diego’s ties to the Navy are well known, but oddly you don’t see a lot out there, except for the maritime museum off of Waterfront Park. We didn’t visit much military stuff, I would have liked to but Vic and my cousin aren’t into that stuff as much. There was amuseum by the Marine base I didn’t get to. Next time. WWII is a very sad time in history. I got into the Philippine resistance out of curiosity. I read a couple books on European resistance and one day had a thought, what about the the other side? My cousin’s 1st hubby was half Japanese and his family was also interned while some served. I’ve been trying to learn more about Japanese Americans back then. It’s weird I’m not into Civil War, Revolutionary, just WWII and now Korea. I think I tend to read about the times my Dad’s family would always talk about at the dinner table. I’ve been realizing that recently. Powerful words, powerful photos, powerful post. This was a great read, I’ve never heard of Walter Cushing, but a true hero in life. The photos you have match the cadence of your words, so it is easy to get lost in this story – and also to wonder, what if he wouldn’t have been turned in. Great post, wishing you a great springtime ahead. Thanks! 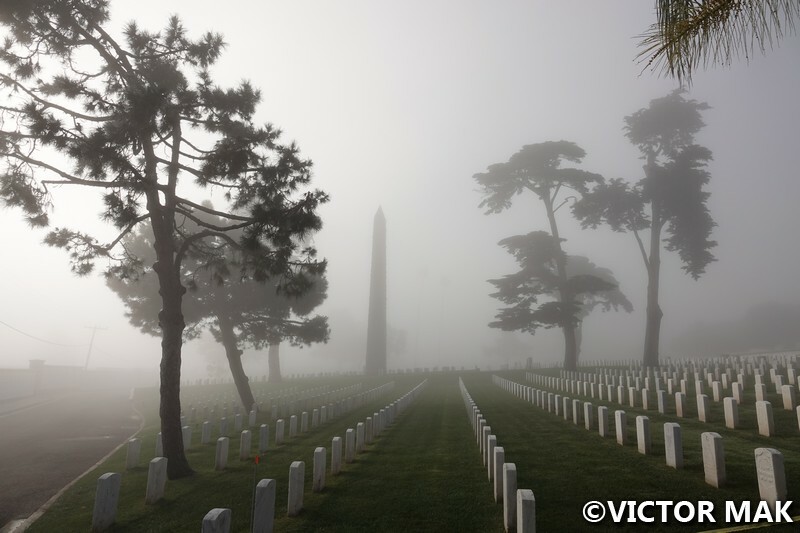 We got really lucky, the weather (fog) was in our favor. My reaction when I first read about Walter was ‘that’s different.’ Wonder how many other stories out there are like that. Another bit that’s stuck in my head is from Outlaw Platoon (Afghanistan). The solider/writer is a fan of Harry Potter and all the other guys make fun of him. Then one day a new solider joins their platoon who is also a Potter fan and he was like, “Finally…” Made me laugh out loud. Random things get stuck in my memory. Any 2019 travel plans? We’re going to Aruba again, Vic really needs to hang out with his fish friends. It’s been a long while and he really misses the beach. Later half of the year we’ll be visiting family in CA and then head to Oaxaca. Part of me can’t wait for 2020, we’re finally headed back to the PNW! Tofino & Seattle. I suspect wars are full of little vignettes like your story of Walter Cushing, many of which are likely never told because of the pain the memories bring to the soldiers. 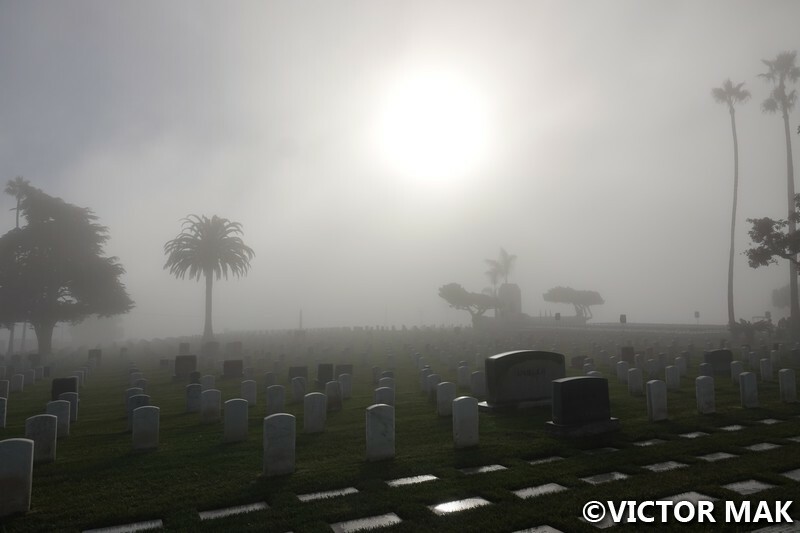 Somehow, the fog in the cemetery seems apt, as well as picturesque. Very good point. The little stories in the books tend to get my attention. Good story and stunning photos. You’re right about the fog. Thank You! It was a really nice view.